Mauri went off to rehearsal one night and came home to notice I had culled our collection of smiling pigs for a better view of the sign: Simplify. Poetic, thought he. It’s kind of a theme around 514—for me anyway. 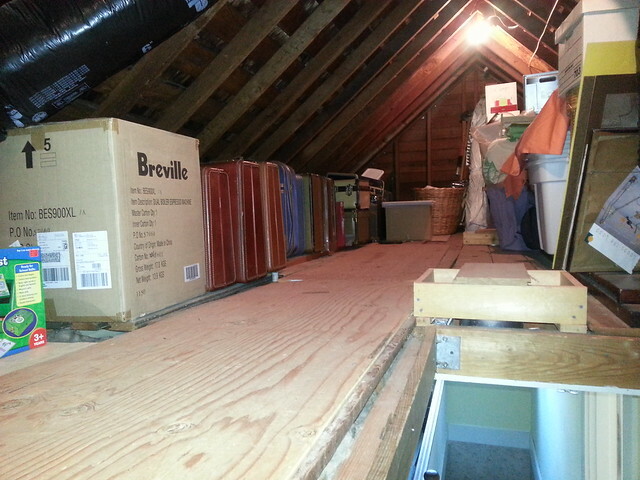 And the several many trips to Goodwill I’ve made in the past few weeks testify to my resolve to simplify. I started at the top. 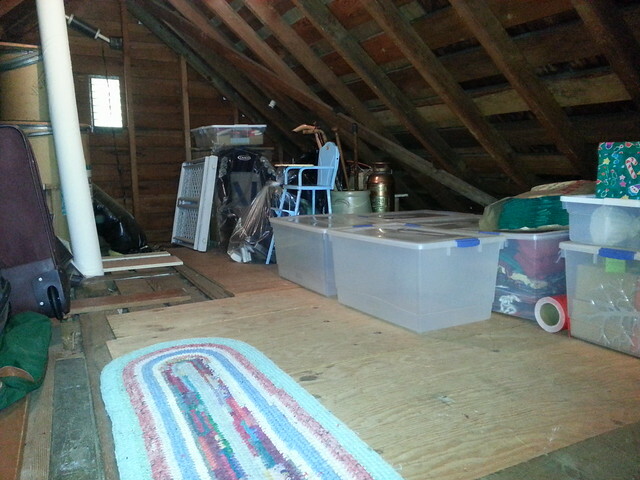 You could eat off our attic floor now, though I’m not quite sure why you’d want to. This is as clear/clean as it’s been in many a year. Christmas condensed to two cartons! 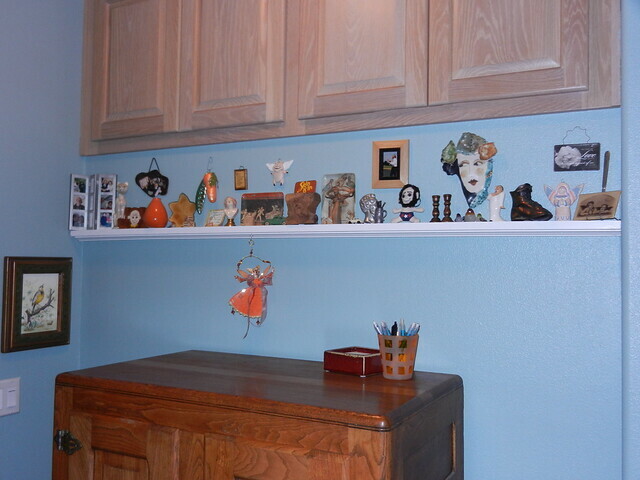 So you see I’ve been at war with clutter. However (isn’t there always a however?) 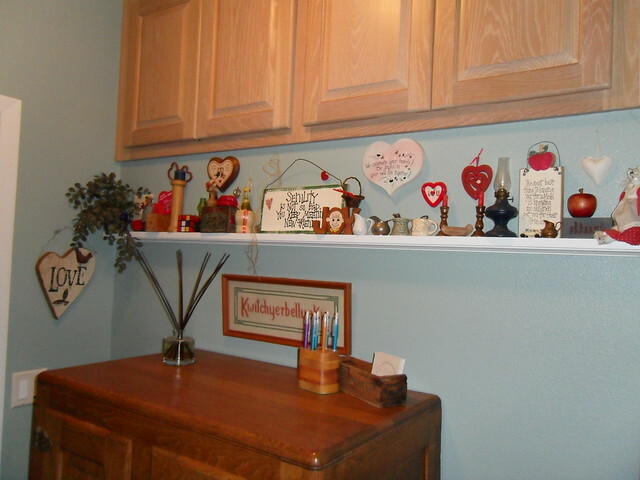 there’s that one spot in the “cookin’ room” where I celebrate clutter! 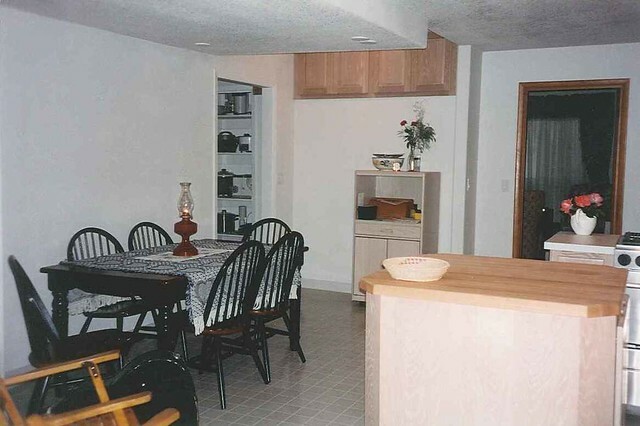 Here’s the starting place, circa 1994, the year of our nuptials, when we added half a house and gutted and rebuilt this space. 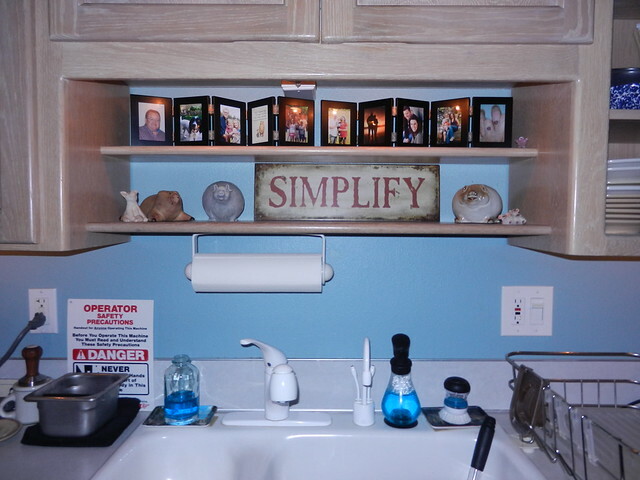 Some time along I cut a piece of trim to make a small shelf, specifically designed to hold some of the precious clutter of our lives. 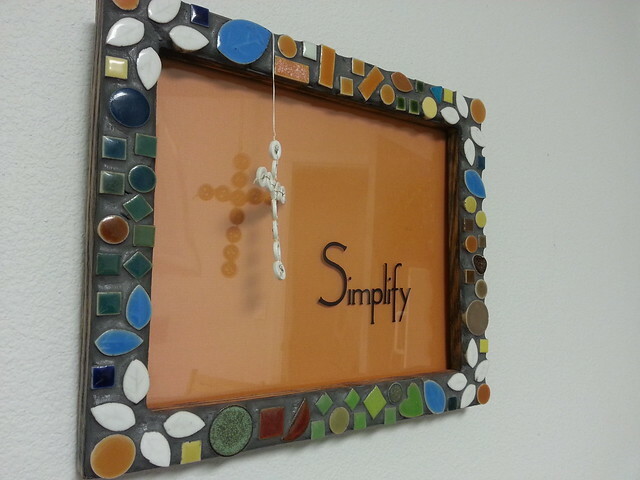 Without much effort you can see a color theme and a heart theme and other themes. Even after an estimated 17 years of the same clutter I still love this shelf. But it was time for a change. All of the old clutter came down, saving out a few gems too precious to put away. 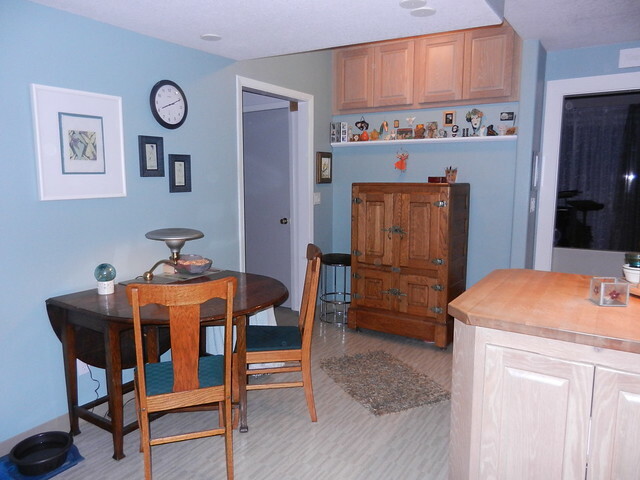 I chose a new color and a couple of themes from among the saved treasures rediscovered in the nooks and crannies of this old house. I understand your response. It’s just more clutter. But not to me. Here’s a close-up of one section. Can you recognize a theme? 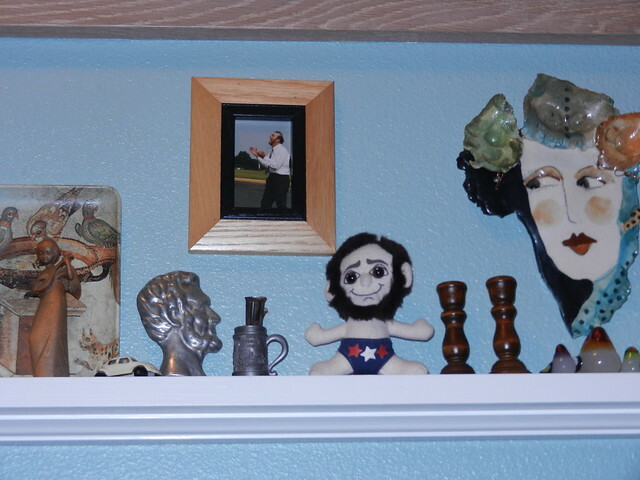 This is my art form, this silly shelf of clutter. I think of it as a collage of stories—Ben’s JOY award from summer camp, Grandpa Nill’s bronzed baby shoe, the carrot and pea ornaments that remind of us “the soup song” we used to sing, the carved block of wood with Mauri’s signature all-caps—JOY (another theme! )—and many others. It’s a visual journal, open on the shelf. And I love it! 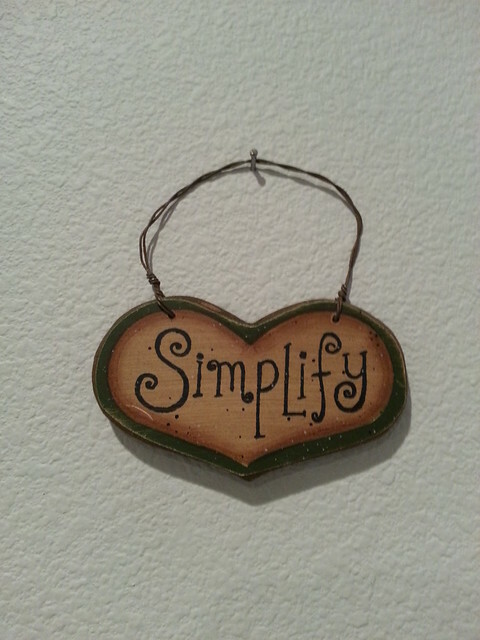 Oh to be able to simplify….married to a “clutter” freak, this is not my future! I’m working on him, but it’s slow going and painful for him…can’t stand change. Sigh….